New Belgium Brewing	Fort Collins, Colo.
At New Belgium Brewing, we remain proudly independent and 100% employee-owned. Maintaining our independence allows us to stay true to our vision and to consider factors beyond the bottom line like our community and the environment. Being independent frees us up to take risks and pursue our passions. It allows us to dare and to dream. The independent path is not the easiest path – there is no safety net and no one will catch you when you fall. That’s also what makes it so rewarding. We have a responsibility to our beer drinkers and to each other to produce world-class beers and live up to our guiding Core Values and Beliefs. As an employee-owned brewery, all of our co-owners are truly members of our communities and that informs our perspective in meaningful ways. 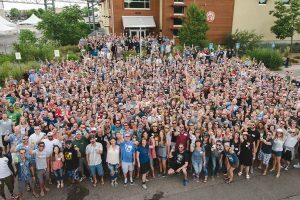 At New Belgium, we feel very fortunate to be a part of this great American brewing tradition and we are especially honored to be part of the craft brewing community. We believe an informed and educated consumer deserves complete transparency as to the ownership of the breweries they choose to support. There may be no other industry that so proudly reflects the roots of American ingenuity and entrepreneurship. People want to support our efforts, and they want to know who they are supporting because in the end, those things matter when you understand what they mean.